Members of the Water Rats competed at a regional and national meet last week. The swimmers had great swims at both meets. The first to travel were our Senior swimmers. 18 swimmers from our Senior team travelled to Greensboro, North Carolina to attend the 2019 YMCA Short Course National Championships. Attending the meet were Richard Nolan, John McNab, Parker Lenoce, Justin Lovro, Andrew Yu, Brendan Berger, Ethan Murray, Emmett Adams, Austin Twiss, Alec Keblish, Jake Ritz, Marissa Healy, Esme Hunter, Lily Kernaghan, Regan Ryan, Claire Kehley, Michelle Kennedy, and Morgan Lenoce. All our qualifiers swam well with several making finals and placing in the top 16. Marrissa Healy placed 15th in the 100 Free. Esme Hunter placed 15th in the 100 Back. Claire Kehley placed 15th in the 1000 Free and Richard Nolan placed 6th in the 200 Breast, 13th in the 200IM, and 8th in the 400 IM. The Men and Women’s relays also had a good showing at the meet. The Women’s team of Marissa Healy, Esme Hunter, Lily Kernaghan and Regan Ryan placed 16th in the 200 Medley Relay and 14th in the 200 Free Relay. The Women’s team of Marissa Healy, Esme Hunter, Lily Kernaghan and Claire Kehley placed 14th in the 400 Free Relay as well. The Men’s team of Austin Twiss, Richard Nolan, Justin Lovro, and John McNab placed 15th in the 400 Medley Relay. A couple of the Senior swimmers broke several team records at Y Nationals. Parker Lenoce broke his own 13/14 Boys records in the 100 Free in a time of 48.28, the 200 Free in a time of 1:44.47, the 500 Free in a time of 4:42.32, and the 1000 Free in a time of 9:35.65. Esme Hunter broke her own 15/18 Girl's record in the 100 Back in a time of 55.56. 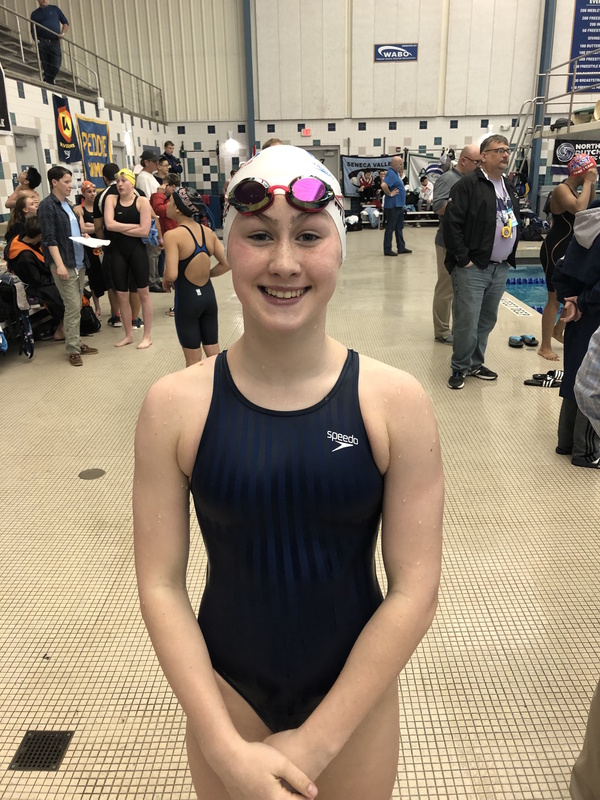 Like their Senior colleagues, several Age Group swimmers travelled to the Eastern Zones Age Group Championships in Webster, NY April 3-6, 2019, and had an excellent meet. Attending Zones were Hope Ivanovich, Jacob Lee, Matthias McFarlane, Christian Michals, Christopher Gregg, Kathleen Murray, Kenneth Clark, Annam Olasewere, and Ayaan Olasewere. All Zone attendees shined, with several making finals and placing in the top 10. Kenneth Clark placed 8th in the 13/14 Boys 500 Free. Hope Ivanovich placed 7th in the 13/14 Girls 1650 Free and 9th in the 13/14 Girls 1000 Free. Annam Olaswere placed 7th in the 11/12 Girls 50 Fly and 50 Free, and Kate Murray placed 1st in the 11/12 Girls 50 Fly and 50 Free, 10th in the 50 Back and 100 IM, and 5th in the 100 Free. Kate also broke a her own team record in the 50 Free in a time of 24.48. Congratulations to all the swimmers who attended Y Nationals and Zones!